In part 1, we introduced the idea of engaging with symmetry. The reason for this guide? In the same way that we tend to love patterns, symmetry is like Nutella for our eyes. And if you don’t like Nutella, what’s wrong with you? Seriously… Nutella is great. And peanut butter. Yum. Nutella AND and peanut butter. Om nom nom. Why do we like symmetry so much? No one actually knows. There have been studies that reveal that babies will stare longer at symmetrical pictures than they will at asymmetrical ones. And scientific evidence also suggests that as a species we’re more attracted to symmetrical faces. In short, there is something extremely appealing about symmetry, and we’re drawn to it. So, then, we need to have a really, really good reason to intentionally mess with this particular guide. In cinema what isn’t shown is almost as important as what is. 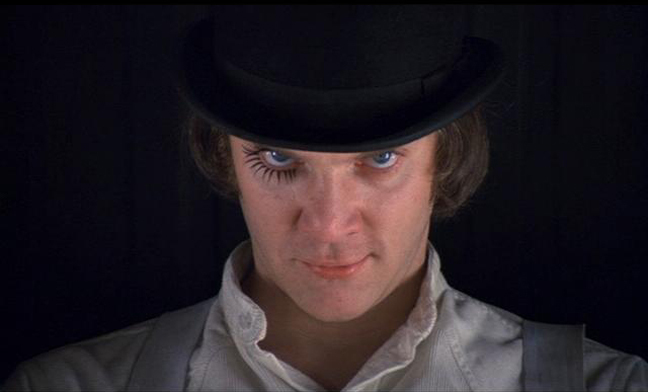 Take the masterful direction of A Clockwork Orange’s opening scene for example. Kubrik could have started with a wide shot of the Korova Milk Bar. Instead, he begins with a 16-second straight-on tight shot of Alex’s (the protagonist) face in centre frame. Why? In an instant, he highlights a contrast between symmetry and asymmetry to describe Alex’s madness and deviant behaviour. Without uttering a word, the viewer immediately perceives the symmetry. But as the 16-seconds lingers, a visual disquiet makes itself known. In addition to being stared at, there was an alteration to the natural balance: Alex has placed black eyelashes on his right eye only. It is only a tiny detail – and yet it is enough for most viewers to be disturbed by this variation, hinting to them that Alex is not normal. This is then emphasised as the long take begins it’s zoom out. Let me say this – and I really can’t stress this enough – there should be no rules when it comes to cinema. Techniques such as symmetrical framing (amongst all the rest) will almost ensure that your image will be aesthetically pleasing. But we do run the risk of creating images that are predictable, common, and quite frankly, boring. Nevertheless – we need to know them, know why they work, know how they work, and know why our piece needs to throw that guide right out the window. Even if it’s by using something as simple as eyelashes. Do you have your own thoughts and symmetrical suggestions? Leave a comment below. And if you would like to check out another blog post looking at symmetry, the you can gorge yourself right here.